Our gallery artists exhibit a mixed exhibition on their interpretation of the theme “Heading West”. 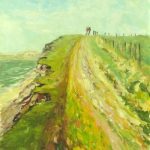 This show features works by Philippa Headley, Colin Moore, Kim Pragnell, Ruth Ander, Jazmin Velasco, Jenny Sutton, Mary Gillett, Teresa Lawton, Mungo Powney all of who have selected works flavoured with western landscapes & seascapes, holidays, and exploration. 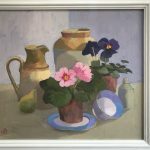 A mixed show to round off the year for all our artists. 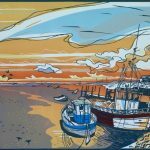 A cracking show where our artists display their differing responses to the interface of land and sea around the British coast. The bulk of works in this show are from Kim Pragnell, Colin Moore, Mary Gillett, and Ruth Ander as well as gallery newcomer Philippa Headley. 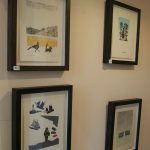 Alongside these we have a limited representation from some of our other artists including Jazmin Velasco and another gallery newcomer Claire Newman-Williams as well as a good collection of many of artists’ material in browsers. 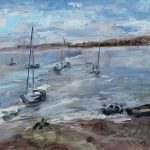 Three artists comprise the bulk of works in this show which includes the period of Dorset Arts Weeks (we are venue 177): Sue Peake, Jenny Sutton, and Kim Pragnell. 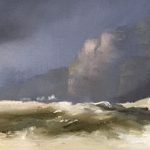 Alongside these we have a limited representation from some of our other artists as well as a good collection of many of artists’ material in browsers. 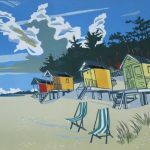 This is a solo show by the well known printmaker Mary Gillett in the main gallery, with a limited representation from some of our other artists in the foyers. 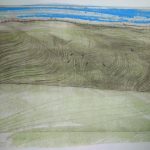 My starting points are often found on Dartmoor and the north Cornwall coastline. 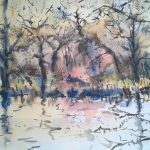 My images are contemplations on how our surroundings can reflect our histories, moods and thoughts. 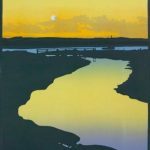 I specialise in etching, a medium that has been developed by artists for its own intrinsic qualities and is now often used to produce single images as individual as paintings. 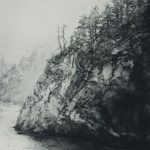 My etchings almost look as if they have been eroded by the elements themselves. 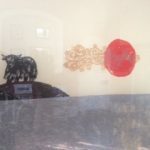 The metal plates have been scored, furrowed, scraped, burnished, re-scored and re-furrowed until their history is symbolic of the very subject confronting me. 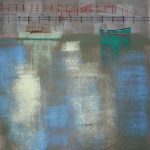 This tactile immediacy is of the essence and combines with the use of light and dark to create images of intense atmosphere. 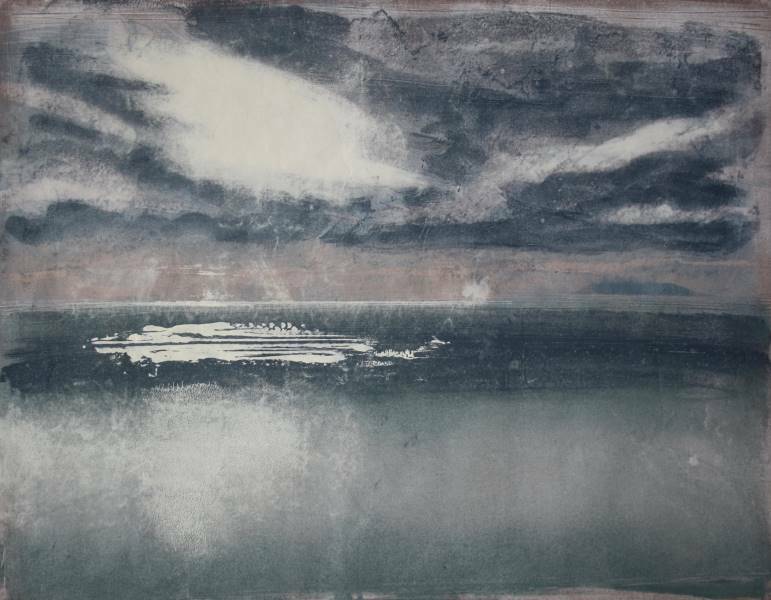 I sometimes apply etching principles to the medium of collagraph so that I can work on a larger scale to reflect my love of painting which continues to influence everything I do. Born in 1953 I moved to Devon with my parents in 1956. 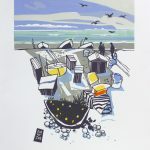 I left home to study art in 1975 and by 1984 had achieved an honours degree in Fine Art at the University of the West of England, and a PGCE and postgraduate diploma in Printmaking at Brighton University. before moving back to Devon in 1988. 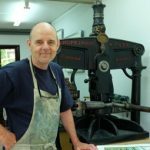 I have over 25 years’ experience of teaching printmaking having founded Tamar Print Workshop in 1992. 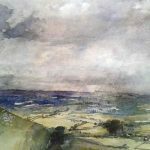 I offer courses exploring a range of techniques and the studio, set in a beautiful position on the edge of Dartmoor, has become a vibrant hub for numerous local artists and printmakers. I enjoy the continuous exchange of ideas generated from this atmosphere and see my teaching as integral to my overall practice. 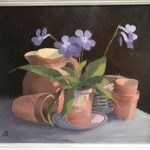 This is a mixed exhibition of gallery artists, though three new artists are strongly represented : Jenny Sutton, Robert Mounjoy, and Mary Gillett all of whom are appearing for the first time and are from adjacent counties. 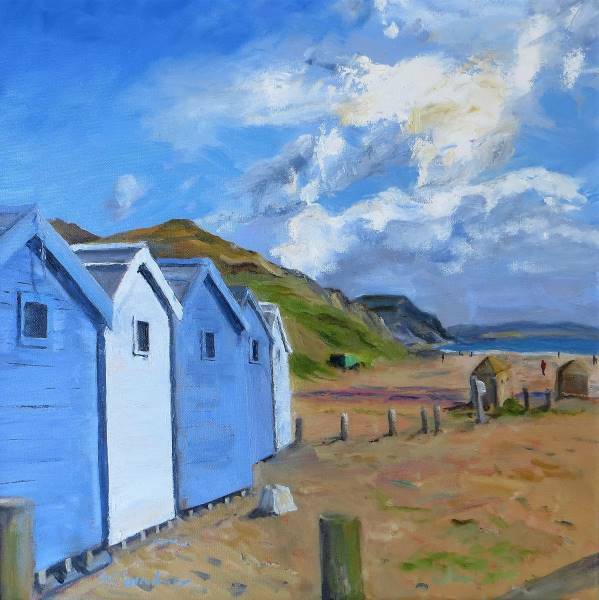 Our Dorset artists such as Kim Pragnell, Sue Peake, Jazmin Velasco and others also make a showing. 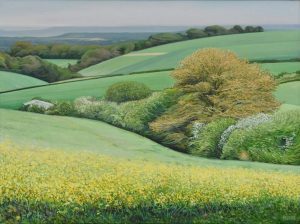 Sue Fawthrop leads this exhibition. 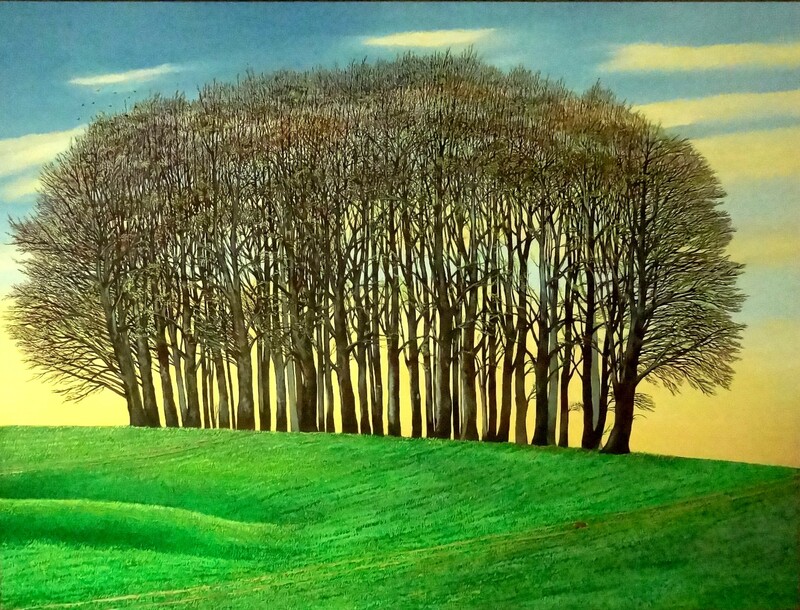 As she says “My inspiration is the land. 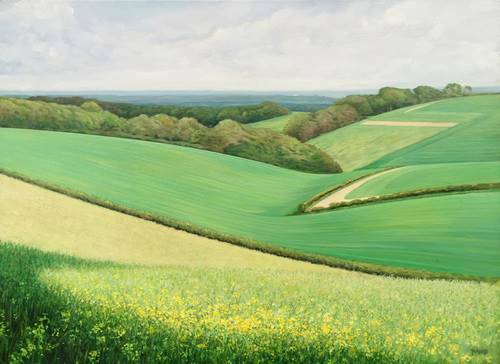 The rolling hills, woodland, long shadows and dotted villages of the English countryside form an ever changing tapestry of shape, tone and colour. This fills me with interest and excitement. 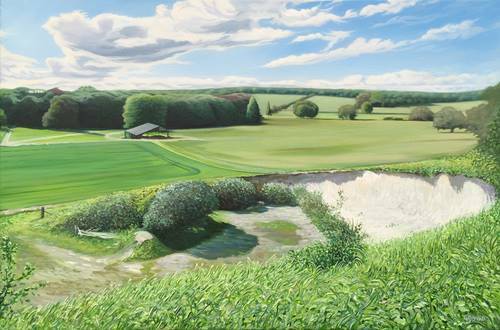 A lot of my work is created “a plein air”, which is a delicious thing to do. 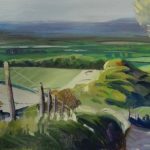 Trying to capture one elusive ray of light as it hits a particularly bright field in the distance, whilst hanging on to your hat and easel in a high wind is energising. You have to make a swift response to a fleeting moment. 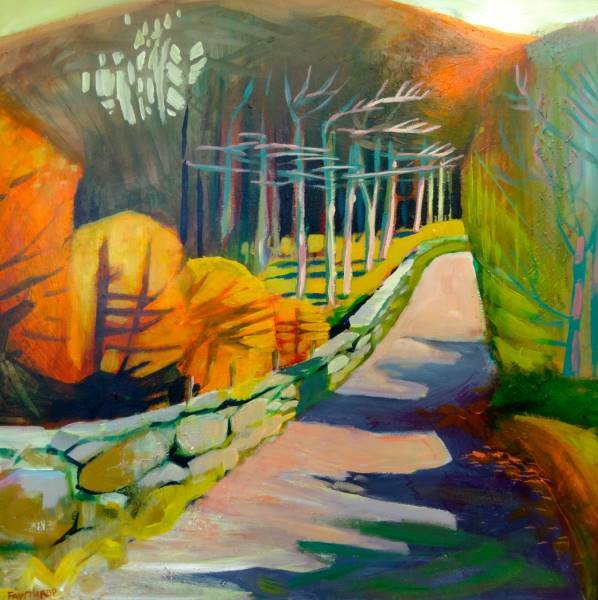 I love the smell of the paint, the light, the weather, the fact that everything is in constant flux. 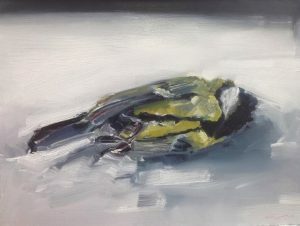 All this energy is infused in the little paintings, along with small insects, bits of grass and occasionally a complete rework as everything has blown over and landed facedown (of course) in mud. 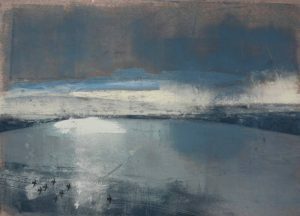 The larger works on canvas and the Lino and collagraph prints are a more considered, painstaking and abstracted response, created in the studio from tonal drawings and reference made on site. 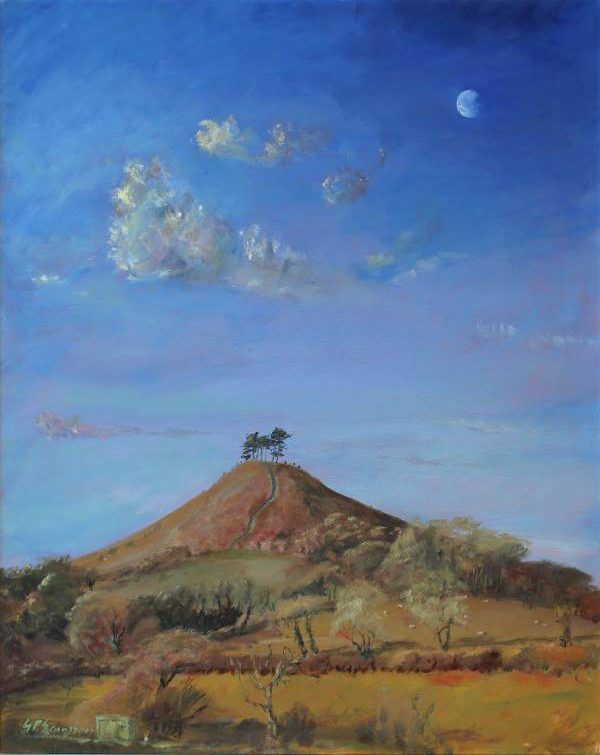 The majority of the work is about Dorset, a series of large oils explore my thoughts about Rawlsbury Camp, a small Iron Age Hill Fort on Bulbarrow Hill. 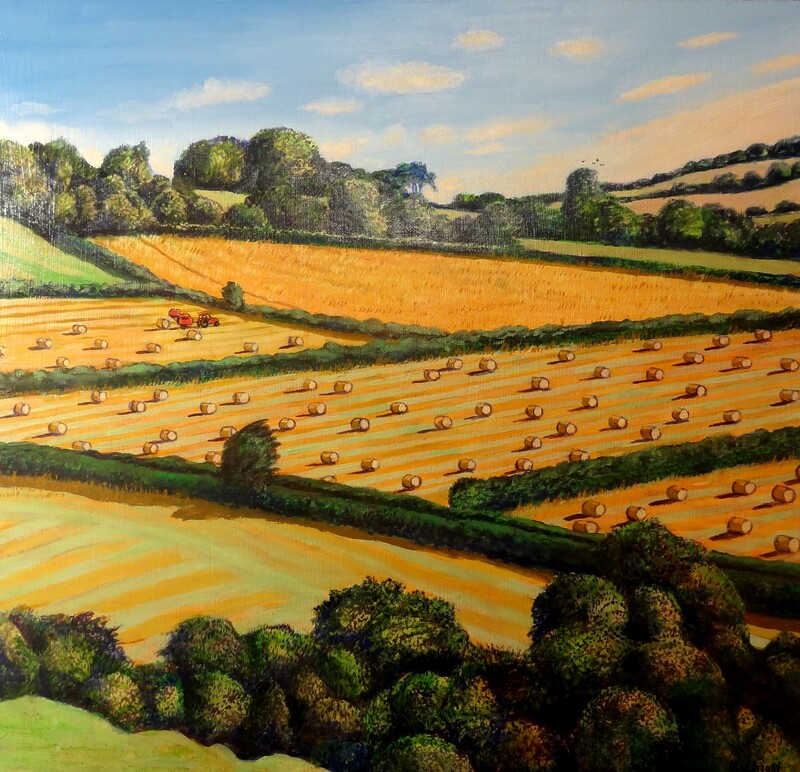 There are also large pieces based on the Cerne Abbas Valley and Milton Abbey. 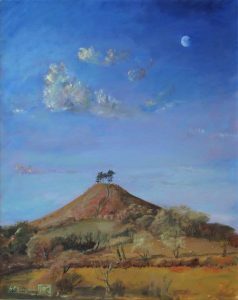 The smaller Plein Air pieces were painted at various locations, from Corfe Castle to Melbury Beacon and many sites on Bulbarrow Hill. 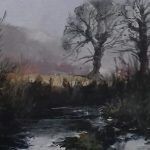 There are also a sprinkle of pieces created on Exmoor, a frequent weekend destination in our camper van (or mobile studio).” Alongside Sue we will be showing relevant works from other gallery artists. 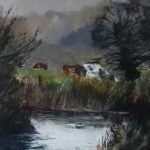 A wide variety of work by many of our gallery artists. 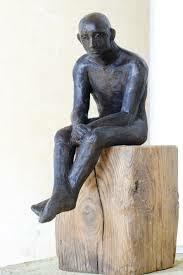 Also showing ceramic figures by Jazmin Velasco : ceramic sculpture, not at all pottery. 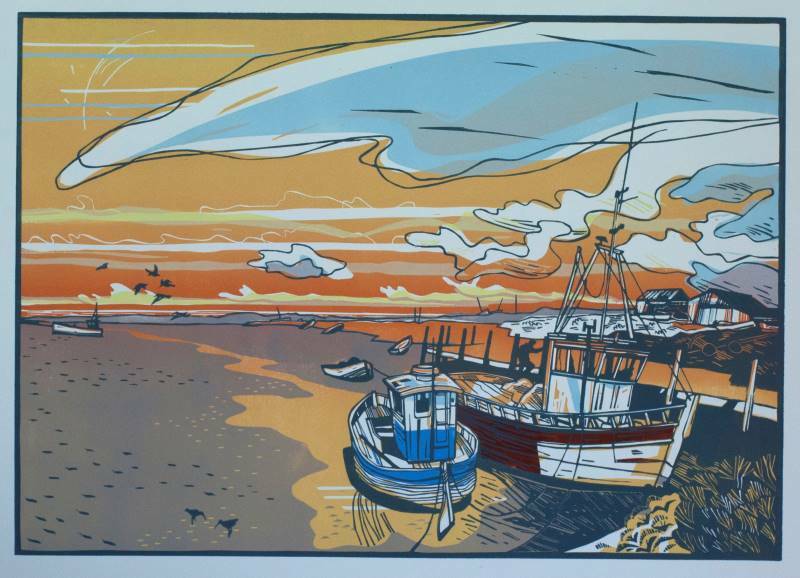 As well as our gallery artists in the foyer we are majoring in the main hall on two of our local fine art print makers – Jazmin Velasco and Colin Moore. Jazmin is originally from Mexico and Colin from Scotland and they come to Dorset by way of Venezuela and London amongst other places. 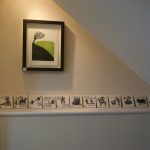 Jazmin also is exhibiting some of her ceramics that share a lineage with recent series of prints. 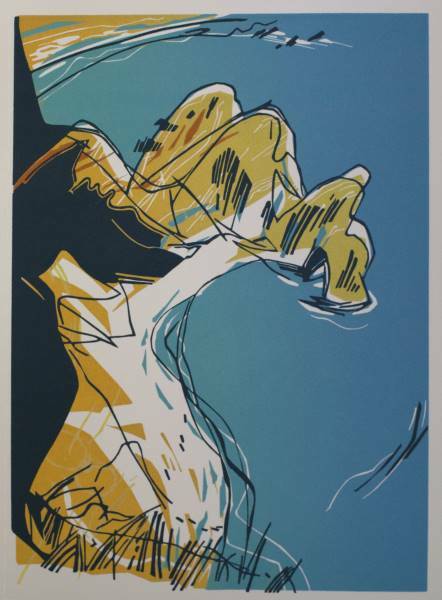 Jazmin Velasco is from Guadalajara, Mexico where she studied graphic design and illustration. Years later she moved to Mexico City to study oil painting and printmaking. 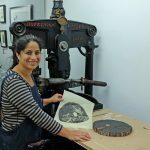 And years and years later she moved to London where she studied multimedia and where she established her work as an artist, printmaker, ceramist and continues to illustrate books. 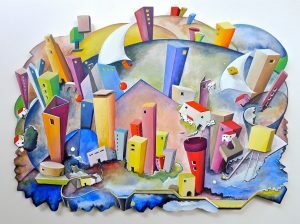 Jazmin lives a few miles from Tincleton Gallery. 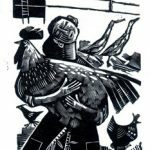 She is a member of The Society of Wood Engravers, The West Country Potters Association and a teacher at the International Summer School Bild Werk-Frauenau, in charge of the wood engraving and letterpress workshop. 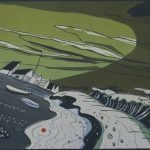 Her prints have been selected twice for the National Print Exhibition and also twice for the Summer Exhibition in the Royal Academy of Arts. 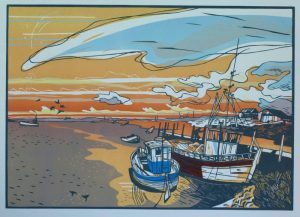 Her prints are in galleries around the UK and we represent her here in Dorset. She is inspired by the work of Jose Guadalupe Posada, the father of Mexican printmaking, and by Leopoldo Mendez who founded the Taller de la Grafica Popular, the celebrated organization which produced the posters and pamphlets that brought the Mexican Revolution to its illiterate masses, and created some of the finest graphic art of the 20th century. But her real love is and always will be Saul Steinberg. Jazmin is also a practitioner and teacher of Taoist martial arts. In China, the arts and martial prowess have been linked since ancient times. The martial arts themselves are a kind of fine art for those who understand them..
Colin Moore was born on the Clyde Coast of Scotland in 1949. 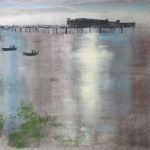 He studied architecture in Glasgow, and following an international career in architecture and design, has worked mainly as a painter and printmaker since 2004. 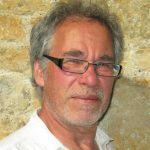 He has lived in Spain, Venezuela and London and currently lives in Dorset, England. His book, Propaganda Prints, art in the service of social and political change, was published by Bloomsbury in August of 2010 His paintings and prints can be obtained from a number of galleries around the UK, including of course ourselves in Tincleton Gallery. 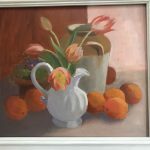 Other gallery artists on show in the foyer George Paul Sainsbury, Kim Pragnell, Sue Fawthrop, and Angelika Seik, , Ruth Ander, plus works from our London contingent of George Christie and Aude Grasset. 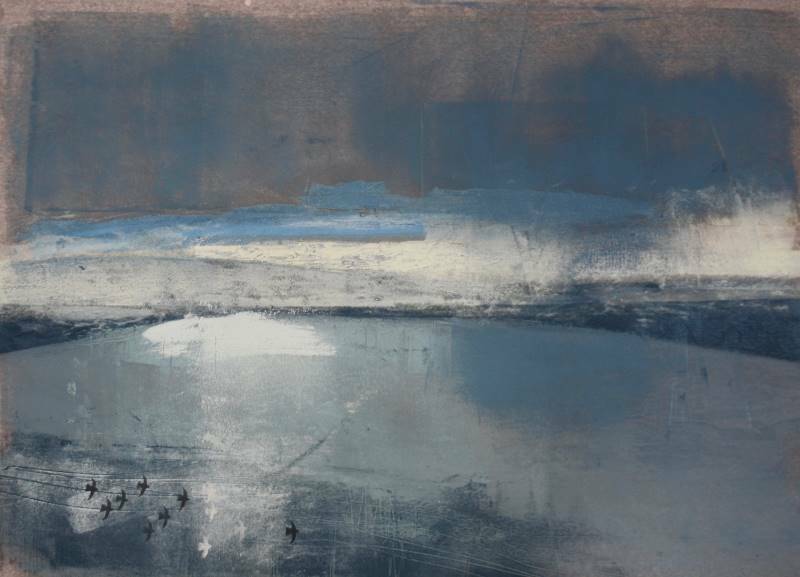 New to the gallery is Alison Wear, who is exhibiting her beautifully designed ceramic pieces. 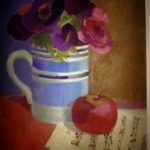 From mono-print to ceramics to oil paintings, our winter exhibition is comprised of a range of artists who work in a variety of materials. 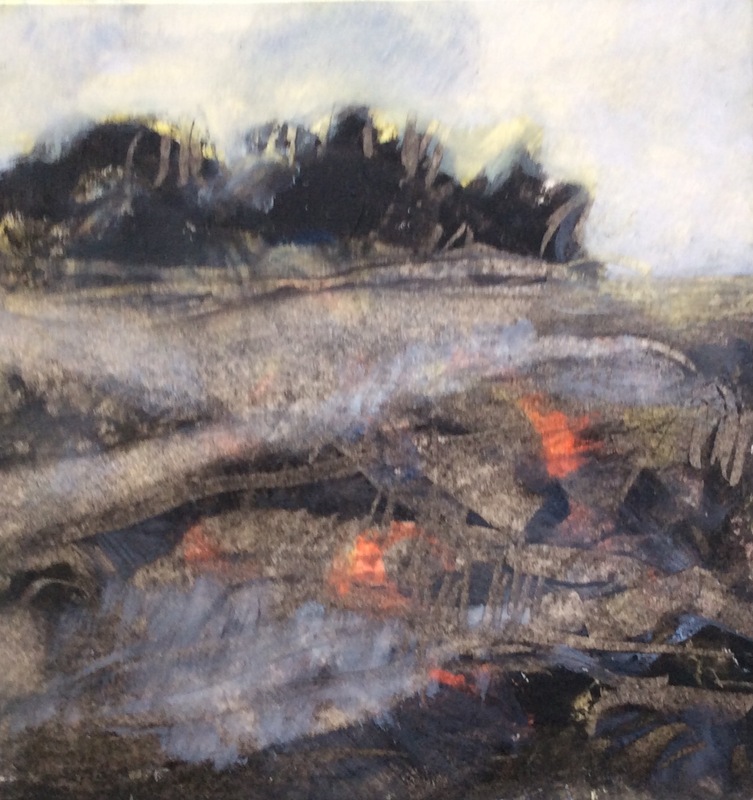 Our regular favourites on show include Lisa Lindqvist, Sarah Moore, George Paul Sainsbury, Kim Pragnell, Sue Fawthrop, and Angelika Seik, Kevin Moore, Jazmin Velasco, Ruth Ander, and Colin Moore, plus works from our London contingent of George Christie and Aude Grasset. 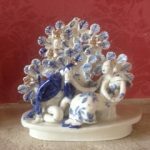 New to the gallery is Alison Wear, who is exhibiting her beautifully designed ceramic pieces. 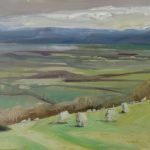 For the next eight weeks we are exhibiting works of Hamish Baird who is a full-time, self-taught contemporary landscape painter, currently based Dorset in the UK. 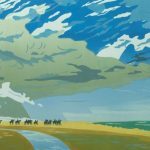 Having previously spent the best part of ten years working as a 2d character animator in Bristol, working with studios such as Aardman Animations, HIT Productions, CBeebies and The Brothers McLeod, he took the decision in the autumn of 2013 to pursue a career as a full-time artist. 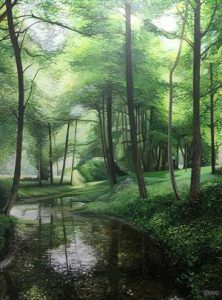 Having been brought up in the countryside, Hamish is not unfamiliar to the outdoor lifestyle and as his work has progressed, it has become increasingly more visible to recognise his passion for the natural environment. 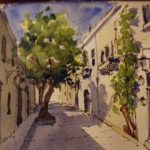 Hamish participates regularly in exhibitions and is always keen to consider taking on commissions. 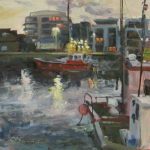 Alongside Hamish we are showing a selection from all our artists including : Kevin Moore, Jazmin Velasco, Ruth Ander, and Colin Moore. 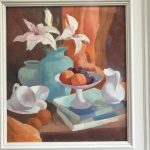 Our regular favourites as gallery artists on show include Lisa Lindqvist, Sarah Moore, George Paul Sainsbury, Kim Pragnell, Sue Fawthrop, and Angelike Seik. 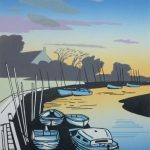 For the next eight weeks, including the fortnight of Dorset Arts Weeks, we are showing a selection from all our artists including four new artists: Kevin Moore, Jazmin Velasco, Ruth Ander, and Colin Moore. 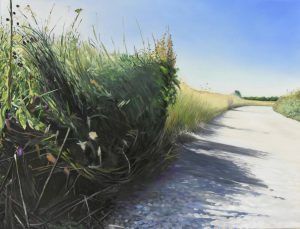 Our regular favourites as gallery artists on show include Lisa Lindqvist, Sarah Moore, George Paul Sainsbury, Kim Pragnell, Sue Fawthrop, Liz Wright, and Angelike Seik. 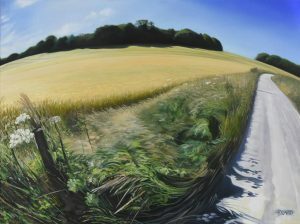 For the next eight weeks, including the fortnight of Dorset Arts Weeks, we are showing a selection from all our artists. 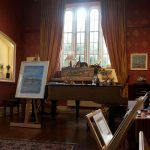 We are normally open 10am – 5pm on Fri/Sat/Sun/Mon but during the DAWs fortnight Fri 27th May until Mon 13th June we are open all week except for the Tuesdays. The sculptor Sarah Moore will also be giving free demonstrations of her techniques at the gallery on Thursday 2nd June and Friday 3rd June. 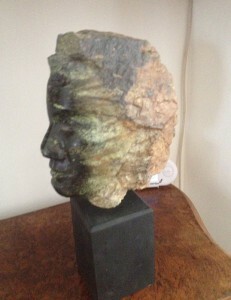 She will be working in the garden (weather permitting) amongst our sculpture collection. Visitors are welcome to come and try their hand at carving. Come and see how a piece of stone can be transformed into a sculpture. 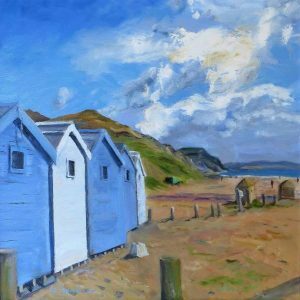 Gallery artists on show will include Lisa Lindqvist, Sue Peake, Sarah Moore, George Paul Sainsbury, Kim Pragnell, George Christie, Victor Redigolo, Sue Fawthrop, Liz Wright, and Angelike Seik. 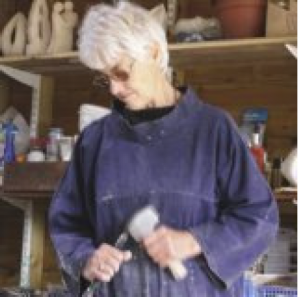 During Dorset Arts Week the sculptor Sarah Moore will also be giving demonstrations of her techniques at the gallery on Thursday 2nd June and Friday 3rd June. 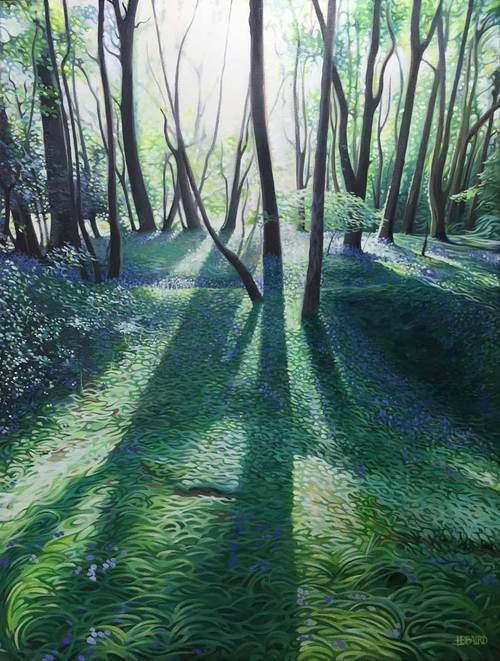 Various of the gallery artists are represented including Hugh Dunford Wood, Lisa Lindqvist, Pete Sheridan, Paul Sainsbury, Martha de Chazal, Sarah Moore, Kim Pragnell, Sue Peake and Liz Wright and for the first time three London visitors including Susan Bezin, Victor Redigolo, and George Christie. 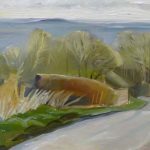 For this show Sue Fawthrop is presenting two different kinds of finished works focussing on the artist’s process, from the intensity of direct observation to considered abstraction and development in the studio. 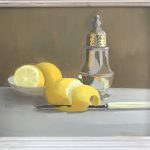 This summer Sue has enjoyed making a series of paintings “on the spot.” Places have included Weymouth and West Bay Harbours and the walled garden in Moreton. Rendered with broad strokes of acrylic on board they are an attempt to evoke the atmosphere of the scene without becoming overcomplicated. 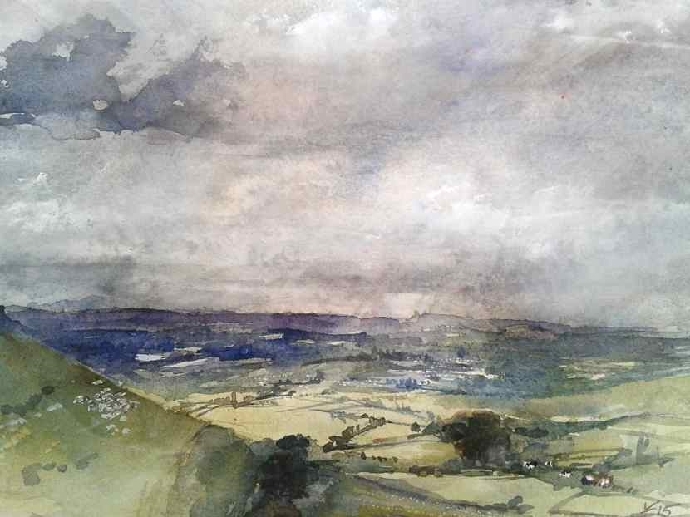 For her normal studio work Sue starts with tonal drawings, making notes about light, colour, events and weather. 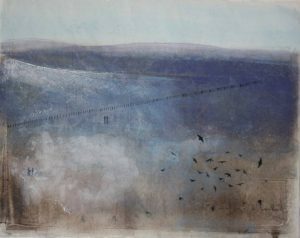 Using the drawings as her source, she experiments with colour, layering texture and areas of collage and leaving some areas under-explained for the viewer to ponder. 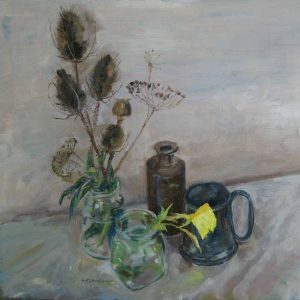 Sue may take elements from drawings and rearrange them, so the resulting paintings just hint at the subject without fully explaining what’s happening. 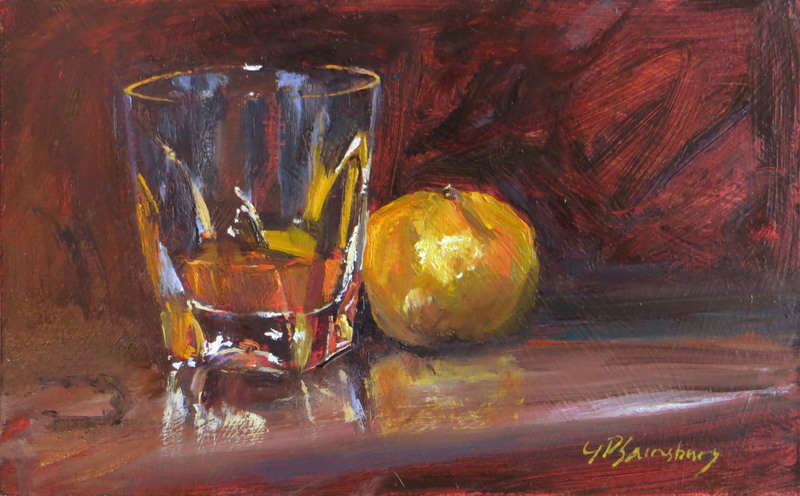 This is a much more considered and methodical approach and produces work in which colour and texture predominate. The resulting pieces are in a variety of mediums including oil, acrylic, collage and various forms of printmaking. 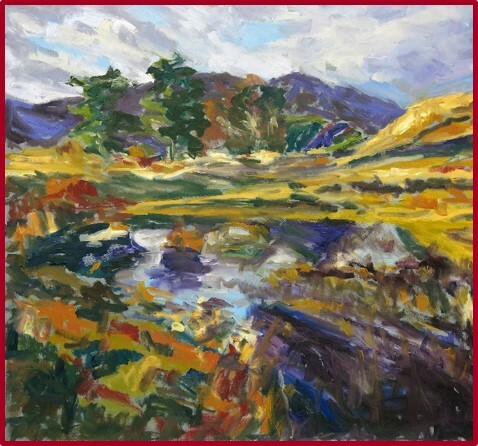 Since leaving teaching Sue has focused on painting and developing her unique style. 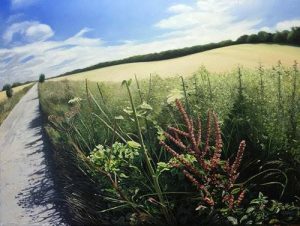 She is a member of the Dorset Visual Images Landscape Project Group and regularly opens her Ansty studio for classes & courses. 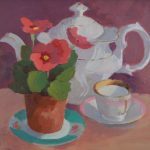 Sue is a member of the Armed Forces Art Society and exhibits in the Mall Galleries each year. 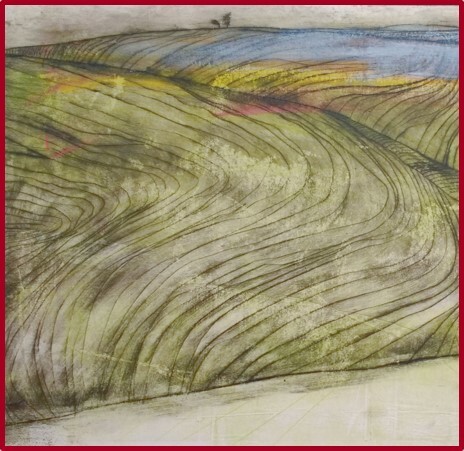 Sue exhibits nationally and her work is held in collections in Europe, Asia and South America. 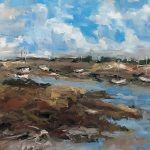 Alongside Sue’s solo exhibition in the main room we are showing the work of other gallery artists in the foyer, including Sarah Moore, Pete Sheridan, Kim Pragnell, Paul Sainsbury, Lisa Lindqvist, Martha de Chazal and Lauran Church. Martha de Chazal lives and works in West Lulworth on the Jurassic Coast in Dorset, England. 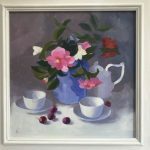 All of the flower paintings are created in the studio using flowers from the garden. The landscapes are painted in situ using oil on canvas. 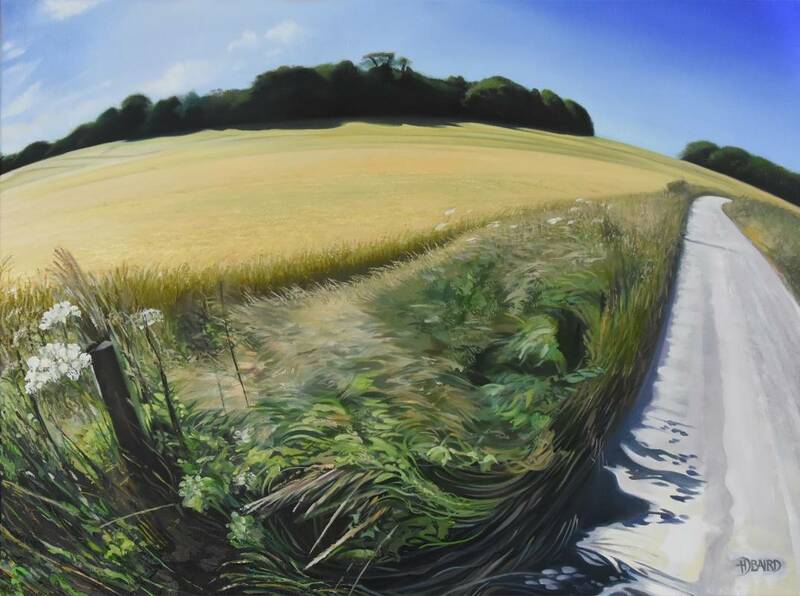 Martha studied fine art at Middlesex University in London. Martha likes to work from observation: she values good draughtsmanship as the underpinning of her work, whether landscape, still life or portraiture. Her paintings and drawings express a microcosm of the Purbeck coast, landscape, and fauna. She aims to communicate through painting and drawing the beauty in the world around her. 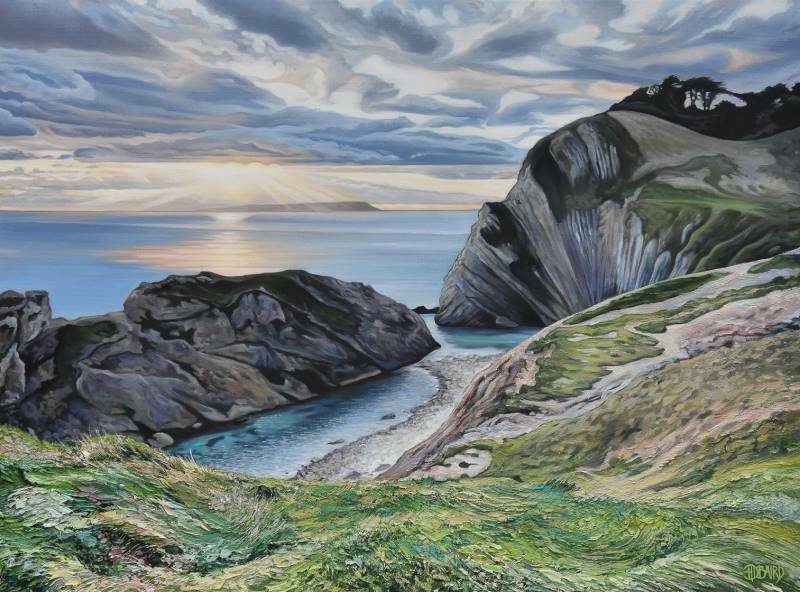 In her landscape work, she has been working on a series of oil paintings of Lulworth Cove. She works on location painting her local landscape and is fascinated by the ever-changing light, differing viewpoints and atmosphere. 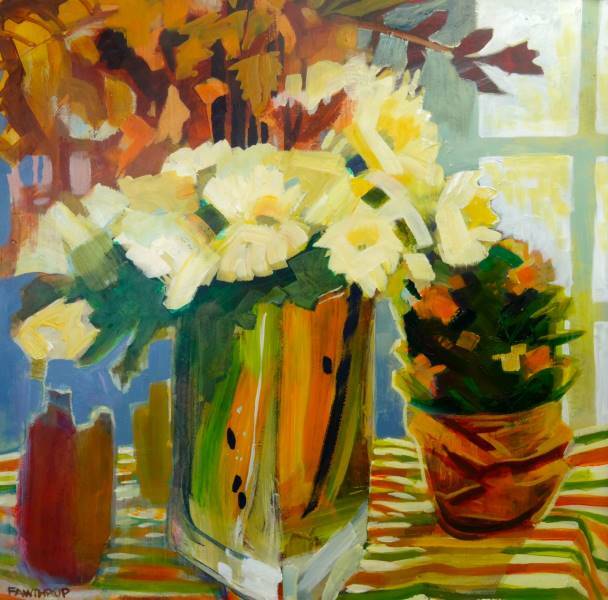 In her studio, she paints flowers and still life. 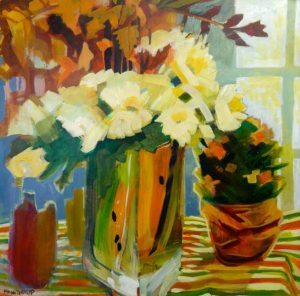 Flowers are an old love and continue to fascinate her through their shapes, colours and the urgency of their short life span as well as their energy and emotional symbolism. Lisa Lindqvist: My work is my way of making sense of the world around me. It’s like a searchlight that never sleeps for very long. 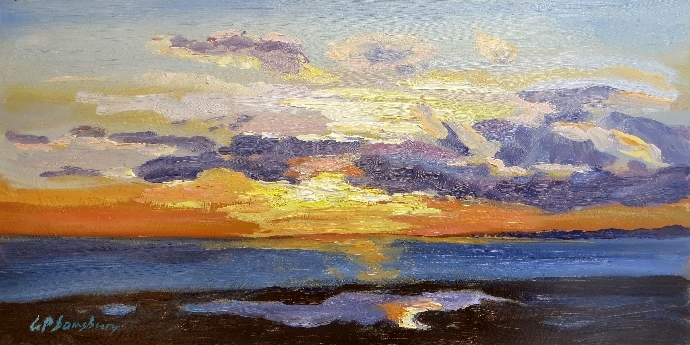 There is an element of self enlightenment that I gain through my art, but moreover I hope it is emotive and revealing for the viewer. I hope for a sense of personal autonomy in my work and in my life and I find inspiration in everything. 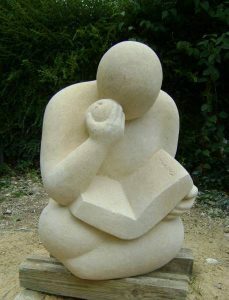 I have studied at the Fink School of Figurative Sculpture, at Wimbledon School of Art, and at Bournemouth & Poole College of Art & Design. 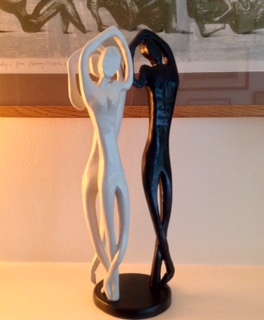 The figure is an ongoing theme and inspiration for me. 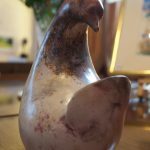 I work in a variety of materials and scales ranging from small waxes of 20cm high to larger than life-size works in cement and bronze. 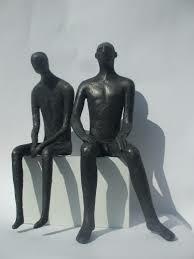 Usually I create a metal welded armature to which I then add cement, plaster or jesmonite. 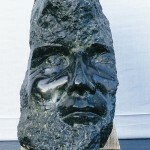 I also cast from clay or wax into bronze, resin, cement or crystacast plaster. I enjoy stone carving and carving plaster which is a different process to modelling but equally challenging. 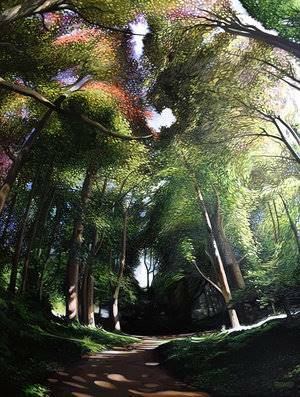 I have sold my work to private and public collectors worldwide. 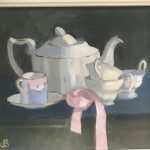 Joan Burdett-Coutts: trained in Fine Art in the 1980’s at The Byam Shaw School of Fine Art (now part of Central St Martin’s) and it was during that time that she developed an interest in drawing from life models, using a variety of different mediums. 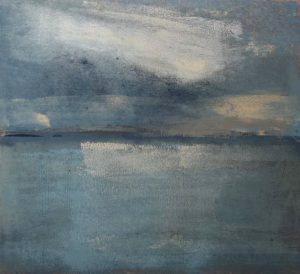 She enjoys the speed and variation of line that can be achieved with charcoal, and also the fluidity in un-predictable nature of water-colour. 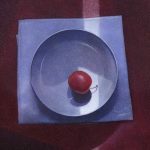 For her a picture from life is not to do with exactness, but an honesty of response to seeing a human form (something that as human beings we all respond to in different ways), and as a rule she never works on a picture when the model is no longer present. 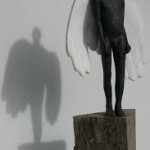 Throughout a drawing session the model might shift position or settle and the light will change. 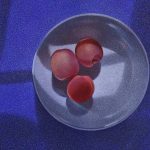 She believes that pictures from life should feel ‘alive’, and often allows previous lines and decisions to remain visible, as this can give a picture added depth and mystery. 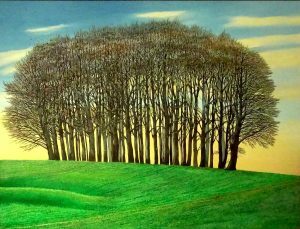 Hugh Dunford Wood has worked as an independent artist designer since student days at Oxford’s Ruskin School of Art in the 1970s. 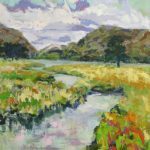 He made a good living painting landscapes and portraits; he ran a fashion business for 15 years handpainting mens’ ties with a team of 24 artists under his direction. He designs crockery, jewelry and wallpapers (www.handmadewallpaper.co.uk). 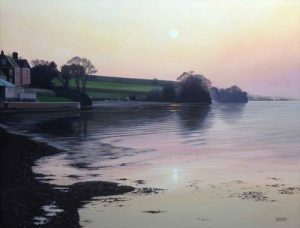 He is a member of The Devon Guild of Craftsmen, Artist Member of the Royal Western Academy, Visiting Tutor at West Dean College, and was guest lecturer at Open University of the Arts. 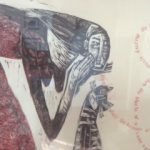 As a volunteer he ran art workshops through the London’s Passage night shelter, where he developed the Streetwise Artpack for homeless people. He ran art courses for detainees at Campsfield Removal Center, and at HMP Belmarsh and other prisons. He worked on a portrait project with prisoners in Philadelphia Correctional Facility, USA. 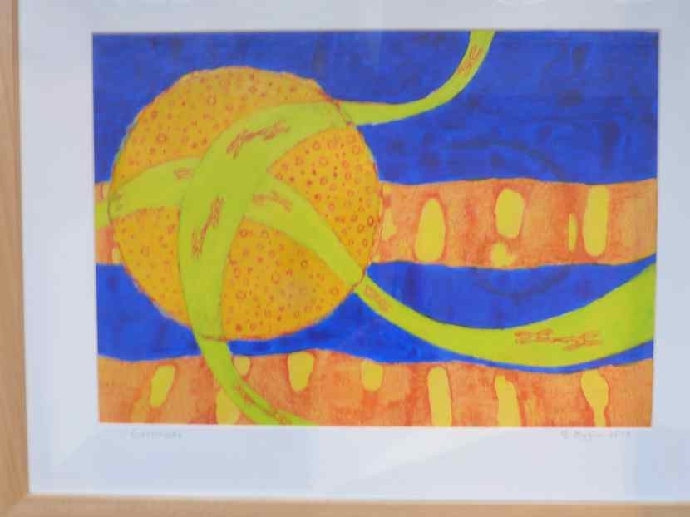 Artist in Residence at The Royal Shakespeare Company (where he developed an art therapy course with actors), and the Globe Theatre when it first opened in 2000, and The Museum of Bermuda Art in 2009 to mark of the 400th anniversary of settlement. 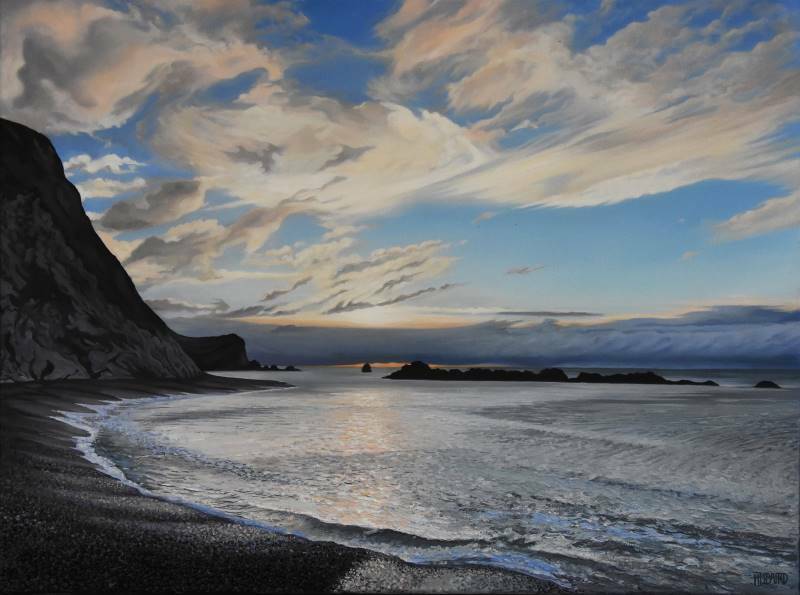 He has also been Artist in Residence with the Church of England in London. 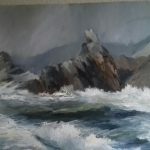 He has exhibited widely in London and abroad with work in the collections of the V&A Museum, Christchurch & other Colleges at the University of Oxford, various County Councils, and private collections in Europe and America. 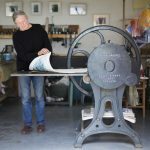 Hugh has always been keen to demystify and disseminate the role of the arts, co-founding the first Open Studio Weeks in Britain in 1983, in Oxfordshire, and the Lyme Regis ArtsFest in 2003. 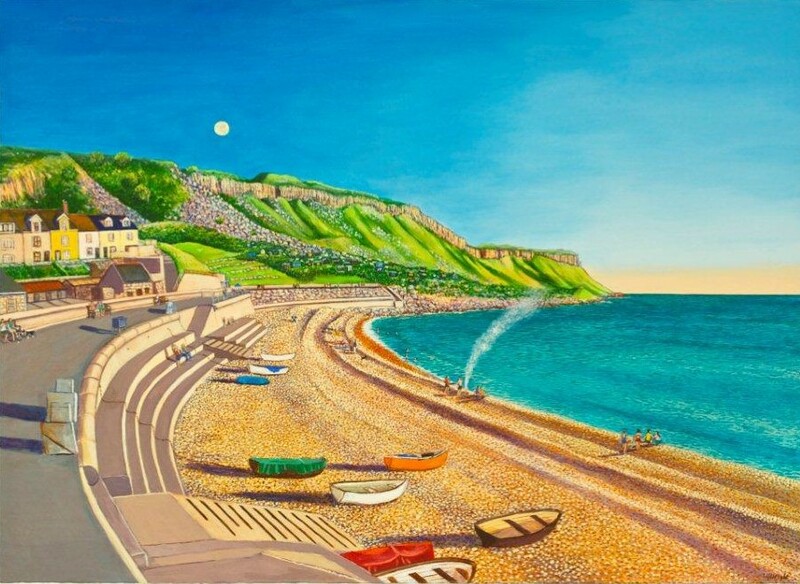 He curates the pop-up National Gallery of Lyme Regis for Dorset Arts Weeks. 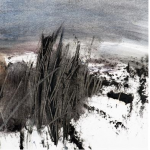 Maggie Farmer: The study of the human figure has been a constant practice in Maggie’s career. However, her aim is to go beyond a mere representation of subject to one that reflects the intimacy of the naked body and a sense of mood & atmosphere. 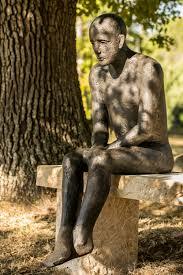 Her life drawing not only stands alone as a means of expression but also informs her other artwork. Maggie is currently an artist in residence at Pavilion Dance South West (Bournemouth). 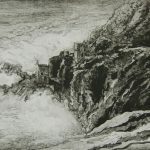 These residencies provide a unique opportunity to sketch at the side of the stage while the various dance companies develop their choreography and run through their rehearsals. 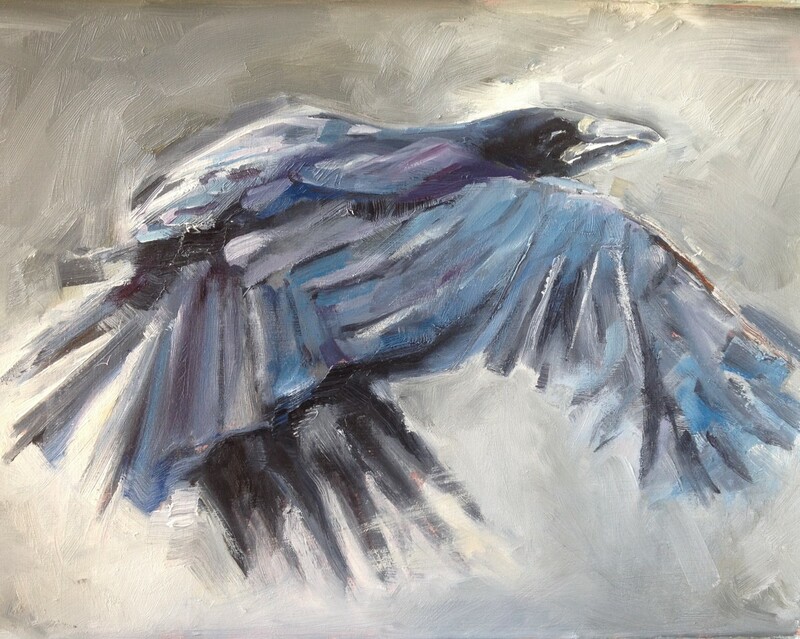 The challenge of capturing movement offers a refreshing immediacy and directness of approach. 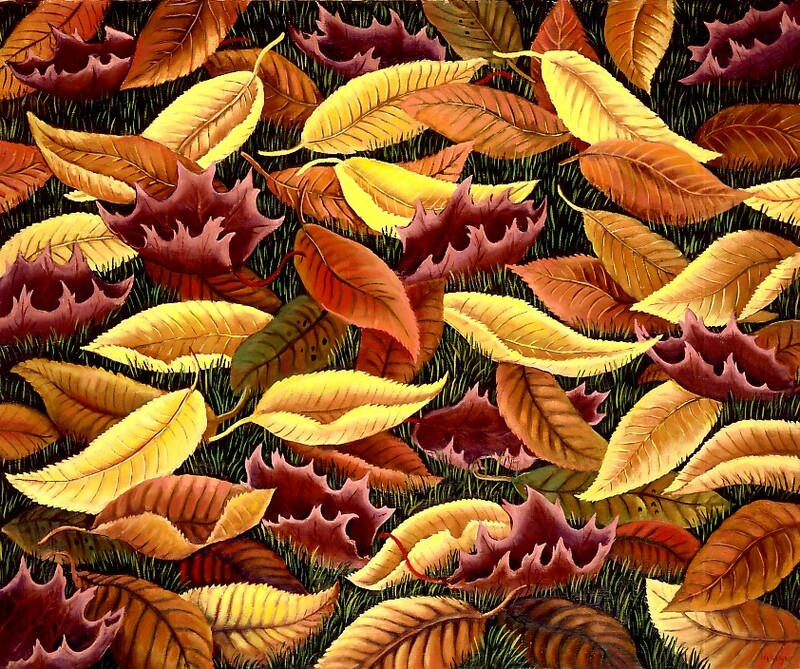 It is a truly spontaneous experience where the eye follows one line of action before being distracted by another. Rather than attempt to provide a freeze frame of the dancers, her aim is to convey the feeling & flow each dance as a whole. She exhibits regularly at the same venue to coincide with the performances. 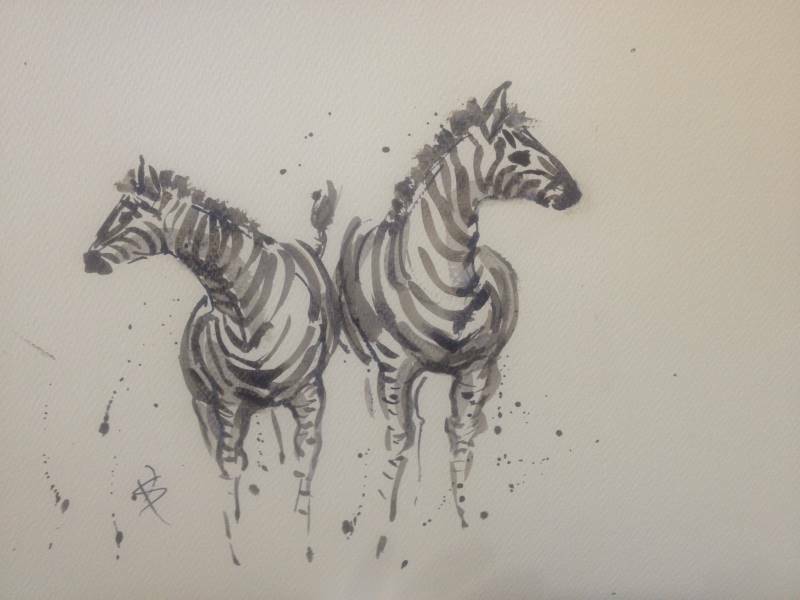 Maggie has an honours degree in Fashion & Textiles and is freelance surface pattern designer. 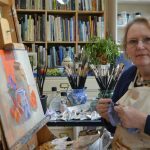 Her experience as a qualified teacher in Further and Higher Education includes textile design, visual studies and fine art. 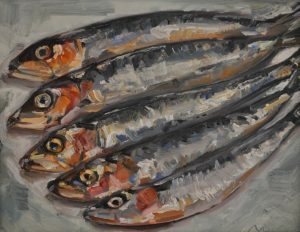 While Maggie deals mostly with the UK and US markets, her artwork has also sold in Europe, Saudi Arabia and Australasia. 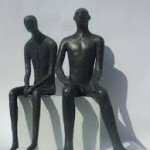 Sarah Moore is a practicing artist and sculptor. 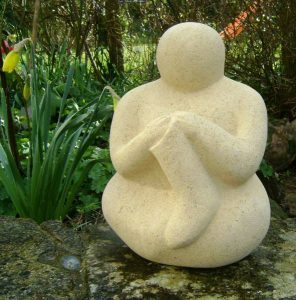 Sarah makes and sells her stone sculptures as well as working on commissioned pieces. 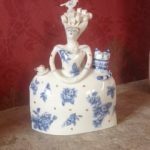 Stone clay and glass are the materials of choice for Sarah , although she also uses wood, mosaics and recycled materials. 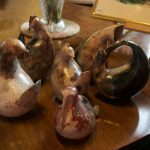 Sarah Moore teaches stone carving and wood carving as well as painting and mosaics. 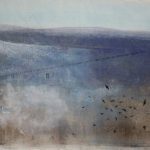 Her passion lies within the materials themselves, how they relate and how an image can be coaxed out of them.